Unseen by the human eye are plentiful microscopic particles, small but mighty polycyclic aromatic hydrocarbons, or PAHs, constantly emitted into the air from a variety of combustion sources. Power plants, forest and brush fires, wood-burning fireplaces, and even the backyard barbeque launch a soupy swell of chemicals into the atmosphere, all bundled into aerosol particles. These trace aerosol components are highly toxic and are believed to increase human risk for cancer. They enter the atmosphere, but how do they get there? And where do they go? What's Been Missing from the Models? Current climate models fail to explain how these aerosols are carried through the atmosphere, traveling far away from their originating source. However, scientists have made progress with the recently discovered, new molecular-scale interactions between the health-concerning PAHs and climate-concerning secondary organic aerosols, or SOAs. From natural and man-made emissions to atmospheric particles, secondary organic aerosol particles are born in the atmosphere and affect climate around the world. Many of these particles include hitch-hiking polycyclic aromatic hydrocarbons, or PAHs, both health-concerning and long-lived, often traveling far from the emitting source. A new research project will track these particles to understand how to better represent their effects in climate models. SOAs are particles formed in the atmosphere when natural emissions, like those from aromatic pine trees meet with carbon-based emissions from coal-burning power plants or vehicle emissions to form a new particle. Recent laboratory measurements that discovered the connection between PAHs and SOAs encouraged Dr. Manish Shrivastava, a Department of Energy-sponsored early-career atmospheric researcher at Pacific Northwest National Laboratory, to conduct modeling studies to understand the effects of PAH-SOA interactions. Shrivastava is leading a team to develop new modeling algorithms, or formulas climate models can use, to understand interactions too complex to observe in real life using a grant from PNNL's Laboratory Directed Research and Development (LDRD) program. Shrivastava and his team will develop these algorithms based on the newly found molecular-scale atmospheric processes, translating the understanding of the long-range transport of PAHs for climate models. Further, they will delve into how the PAHs interact with natural particles in the atmosphere, to ultimately update climate models. How Do they Live Long and Prosper? Following measurements from previous studies, the team will develop novel modeling algorithms that show how PAHs are trapped in larger organic particles-essentially hitching a free ride as the SOAs travel far distances. This synergistic PAH-SOA interaction shows how the climate-relevant SOA particles act as efficient vehicles to protect and carry cancer-causing PAHs, capturing and shielding them from chemical degradation and evaporation as they travel. In turn, the PAHs increase the number and weight of the SOA particles. This newly found bond between the two may be the reason why both the PAH and SOA particles live so long and travel so far. Their research, expected to wrap up in in the next two years, promises to demonstrate why the new SOA particle treatments are needed to better inform policy decisions related to both climate and human-health resilience in a changing world. Shrivastava's LDRD grant funds up to two years of study into the effects of PAHs on the climate. His was one of 5 projects awarded out of 90 proposals submitted at the lab in 2015. PNNL's LDRD program is designed to enable research staff to pursue innovative ideas that enhance core scientific and technical disciplines. Thus, the LDRD emphasizes cross-disciplinary research to promote a synergy between science and technology. 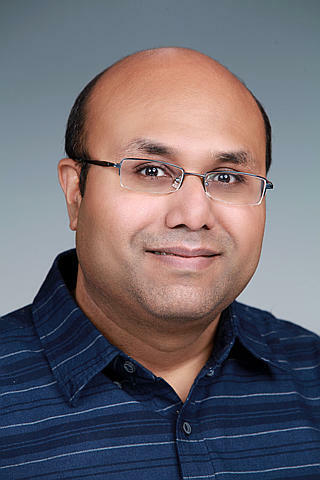 In one sentence: Dr. Manish Shrivastava is leading a team to develop new modeling formulas climate models can use to understand atmospheric particle interactions too complex to observe in real life using a grant from PNNL's Laboratory Directed Research and Development program.